Kahlina music is more than just music. Support a talented, creative, unique, independant and original multi-instrumentalist. Kahlina has a lot of interest in space and astronomy. That and experiences in life are the things where she gets a lot of inspiration from. Kahlina is a female solo intrumentalist(one [wo]man band), songwriter and producer. Writing her own lyrics and music, recording - mixing and mastering, promoting and producing it. From a young age she enjoyed music and singing. She joined a childrens choir and already performed for some big audiences. Her first instrument was a flute. Driving her brother crazy with the false notes, but eager to get it right and also played on her mom's and dad's guitars in the attic. Later on she got her own guitar and taught herself to become better, just by practicing every day. Not giving up on her dream to become a musician. The bassguitar is her main instrument at the moment but it's also the only instrument for which she had formal training. Stubborn as she is, she always likes to be different which also translates into her music. Always looking for the sounds that are new, unique and original. Looking for those sounds that you do not expect when you accidently hit a wrong note or when you do something you are not supposed to do. This results in mixes of genres and styles. 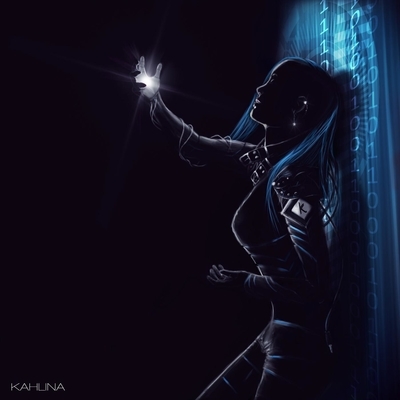 Kahlina likes to mix (hard)rock with electronic music and add other influences such as orchestrial and heavy D&B sounds.